The Board of Directors ensures the general management of the organization and is composed of three members. The chairman and maximum responsible for the institution is currently Leonel Sousa. 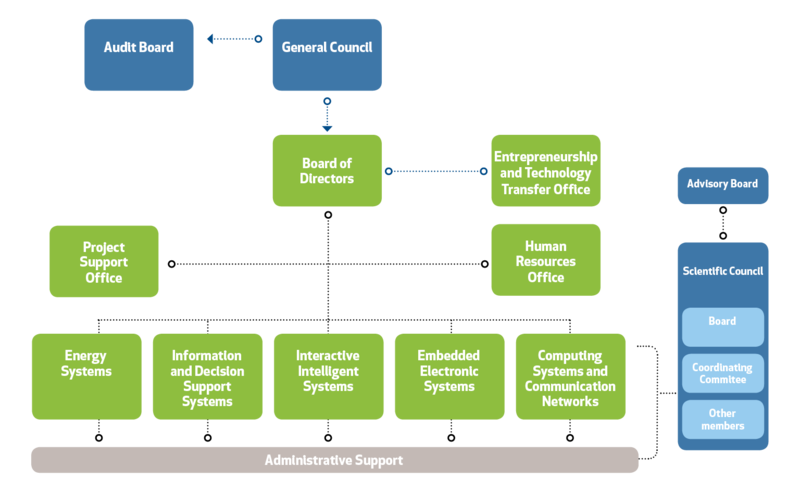 The Board of Directors is assisted by the Project Support Office, the Human Resources Office, the Technology Transfer Office and other administrative support units. The Scientific Council is responsible for the strategic planning, the organization of the research units, and evaluates the research projects, annual budget, plan and report. It is composed of all researchers with a PhD degree, and coordinated by the Coordinating Comitee, composed by the Board of the Scientific Council (three members) and representatives for each one of the five main research lines of the organization. The General Council approves the annual technical and financial reports of Inesc-ID, as well as the annual plan and budget. It is constituted by three representatives of Instituto Superior Técnico, two of INESC, and by the chairman of the Scientific Council of INESC-ID. The Advisory Board is composed by external advisors that provide advice concerning the strategy and plans of the Institution. The Entrepreneurship and Technology Transfer Office is the Inesc-id administrative unit with the mission to support INESC-ID board of directors into bringing INESC-ID’s innovations to the market through intellectual property valorization, industry partnerships and the creation of new business ventures. This office is assisted by a tecnology scouting with one member for each Inesc-Id’s research line of action: Gil Marques (ES), Helena Sarmento (EES), João Garcia (CSCN), Bruno Martins (IDSS) and Daniel Lopes (IIS). The Projects Support Office supports general applications for competitive funding and also the management of research projects. The Human Resources Office is responsible for the human resources affairs of INESC-ID.